The Lifx A19 (or A60 if you’re in the UK) initially strikes an odd chord. It isn’t as natural a light as you’ll get from the Philips Hue, but once you get used to that the color range that it has to offer is fun, and actually pleasant to live with. Smart lighting is without a doubt one of the most useful – and most fun – elements of the smart home. The ability to make your lights turn on, dim, and even change color, all just using your voice, starts off as incredibly novel, and swiftly becomes a staple smart home feature. Lifx has created something interesting with the A19. It doesn’t try to ape the design and performance of a traditional filament light bulb like its biggest competitor (Philips Hue) does. Instead, Lifx really leans into the cool, funky angle, pushing the range of colors and the futuristic look of the bulb itself. The Lifx A19 is available worldwide, under slightly different names. In the US it’s got an RRP of $59.99, in the UK it’s known as the A60 and costs £59.99, and in Australia it’s back to the A19 and costs AU$89.99. At the time of writing Lifx was having a sale, knocking $10 off the full price so it’s worth keeping an eye out for sales. Unlike the Philips Hue bulbs Lifx doesn’t need a hub to work, so the initial cost will be slightly less, even if the individual bulbs are more expensive. The Lifx A19 / A60 looks like a lightbulb, only more tech. It’s a little too large for a conventional bulb, and some of the lines are in the wrong place. Where competitor Philips has gone with a ‘it’s a normal lightbulb, honest’ look with its design, Lifx has made a statement. 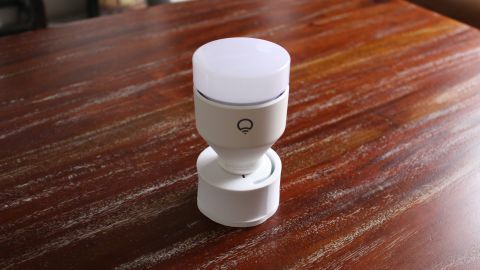 Even when it’s off, you definitely know it’s a smart bulb. Whether that works for you is a question of preference. The white casing and white plastic hockey puck-style ‘bulb’ will stand out – but then how often do you really look at your lightbulbs? The bulb comes in both a screw and bayonet cap so will fit into any fitting, and aside from a Lifx logo, the design is very understated. Installation is as simple as popping the Lifx A19 into the light fitting. That’s it. No attaching panels to walls like with the Nanoleaf. Set-up of the bulb with your phone is a little more complicated. You need to use a smartphone to connect to a Wi-Fi signal being transmitted by the bulb, which allows your phone to connect the bulb to your home’s Wi-Fi network. We usually dislike this method of setting up a device, but our experience in this instance was pretty painless. As the light had already been set up in another location before we got it home, it needed to be reset, and this was as simple as turning it on and off again five times in rapid succession using the lightswitch. You’re given the option to either use the Lifx app to control the bulb, or control it via a third-party system like Apple’s HomeKit, Amazon Alexa, Google Assistant or IFTTT. When the Lifx A19 first burst into life we were a little startled by how bright and artificial the light it emitted looked. However, the Lifx app has a vast range of options for adapting the light’s output, and we were able to quickly find light settings that we preferred. The level of customization can be a little overwhelming if you’re just going for the ‘stab in the dark’ approach to finding a color you’re happy with, but if you’ve ever used a color wheel in Photoshop or similar software you’ll be right at home with the color selection from the Lifx app. Thankfully, if you’re just looking for a more standard ‘white’ light, there are a number of preset whites, ranging from a harsh, clinical light to a warm amber glow. It’s worth highlighting again that none of these look like the soft glow you’d get from an old-fashioned filament bulb, but once you get used to that, the unnatural orange glow is actually very pleasant to sit in and enjoy. In addition to tone, you’re also able to adjust the light’s brightness, and you can get some genuinely lovely light out of this bulb. Once you’ve found a lighting effect that you like, you can save it as a custom lighting option, so you don’t have to go through the entire process from scratch every time you want to find your perfect setting. You’ll get the best level of customization from using the Lifx app, so while third-party integration works you’ll get a greater degree of control via the app, more so even than via Apple’s sophisticated Home app. Obviously when using voice commands you’re limited to ‘broad brush strokes’ control, so you’ll be able to choose ‘red’ or ‘green’ for example (we can’t imagine anyone actually wanting green) but not the nuance of a specific tone. When you select ‘white’ it’ll go for a tone that’s close to that of a traditional bulb. Because Lifx bulbs work across all smart home platforms and ecosystems, it’s incredibly easy to include them in routines, or scenes, or whatever your particular ecosystem refers to these setups as. So, for example, you can set your Lifx bulb up to join in with your morning wake-up routine, or even set up an IFTTT command so your lights turn red if your heating gets above a certain temperature. The Lifx A19 / A60 is definitely the bulb we’d recommend for someone looking for an individual ‘feature’ light, rather than a replacement for a conventional lighting setup. The bulb works straight out of the box and doesn’t require a hub, which could well draw some people away from Philips Hue (it’s certainly a cheaper option), but the light that it throws isn’t as natural. The result of this is that you can end up sitting in some pretty unconventional lighting states, which we enjoyed once we got used to it, but which may not be to everyone’s taste. And given that the Hue range is capable of creating some extreme colors of its own, as well as conventional lighting effects, it would be nice to see some more traditional options added to the Lifx range.